Cartoonist Tom Glover drew under his own name for New Zealand Truth and under the name T. Ellis for the Free Lance. His 1916 cartoon for the then left-wing Truth depicts Prime Minister William Massey acting as a puppet of the capitalist Mr Fat, as he refuses to conscript wealth for the war effort. The 1919 cartoon for the conservative Free Lance shows a labour agitator introducing a suspicious Australia and New Zealand to a villainous Bolshevik (communist), who aims to corrupt them. 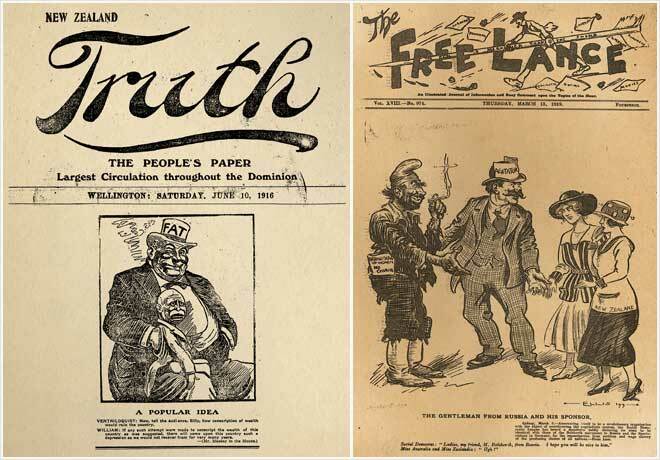 Reference: NZ Truth, 10 June 1916, p. 1 (left); Free Lance, 13 March 1919, p. 3 (right).